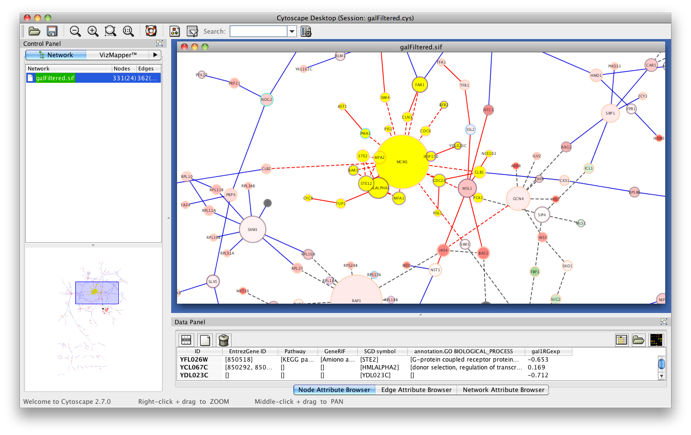 Start Cytoscape and load the network galFiltered.cys from the sampleData folder in the Cytoscape directory. 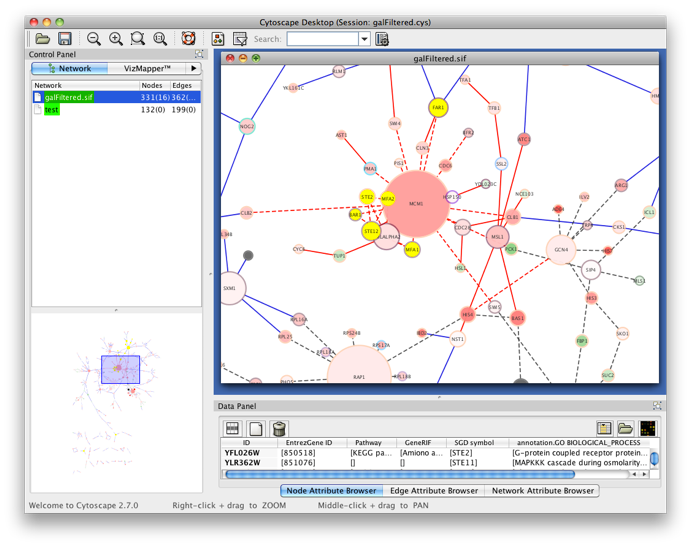 Select a cluster of genes from the network (indicated in yellow). Select BiNGO from the Plugins menu. Select some interesting GO categories by checking the boxes on the left side of the BiNGO output window. Then press the Select nodes button. 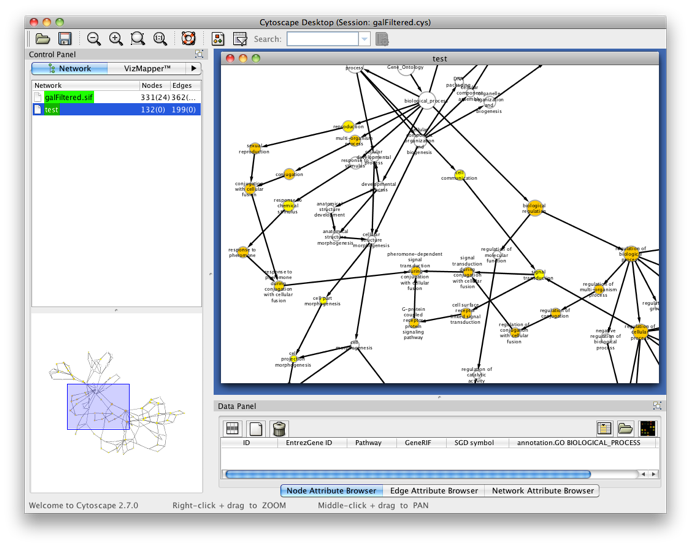 All nodes in the original Cytoscape network (not only in the selected cluster) annotated to one of these categories are highlighted. which is basically a set of protein kinases. 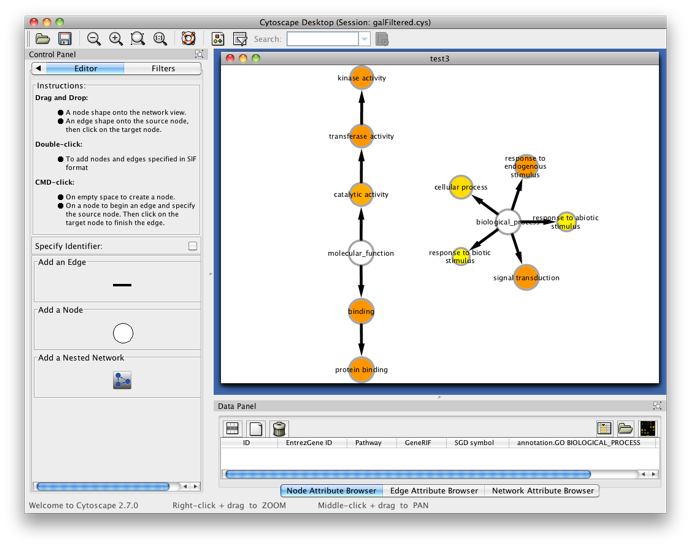 This time, we will use a custom annotation and ontology file. Download the files gene_association.tair and gene_ontology.obo from www.geneontology.org and save them somewhere on your computer. Specify these files under Custom... in the Select organism/annotation and Select ontology file panels, respectively, and set Namespace to goslim_plant (this is a slimmed-down version of GO for plants). Hit the Start BiNGO button again. You will get the following screen. Observe that you can perform as many tests as you want in a single BiNGO session. 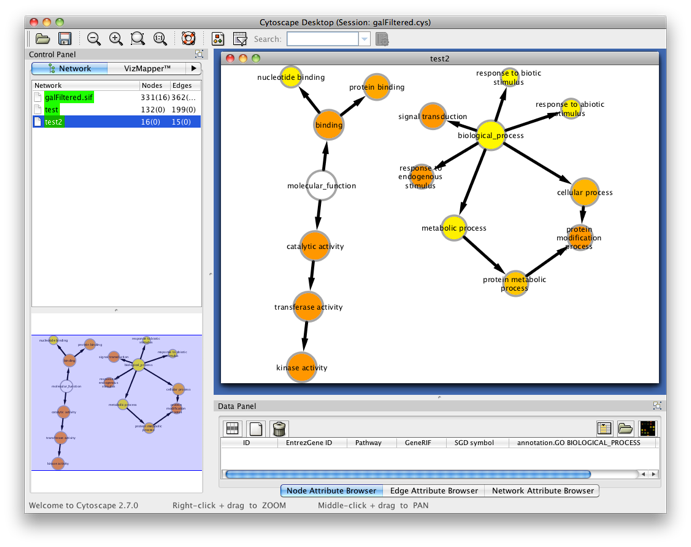 The resulting GO subnetworks will be labeled with the names you gave to the clusters, and each BiNGO network has its own visual style (called BiNGO Style for <cluster name> in Cytoscape’s Vizmapper), mapping attributes such as p-values and number of genes in the cluster belonging to a certain GO category to the color and the size of the nodes, respectively. Try some other settings and options. In most cases, BiNGO will stop you if you're about to do something wrong. Still, there are several peculiarities and potential pitfalls you should keep in mind while using BiNGO. Please look at the Manual and the FAQ for more details. 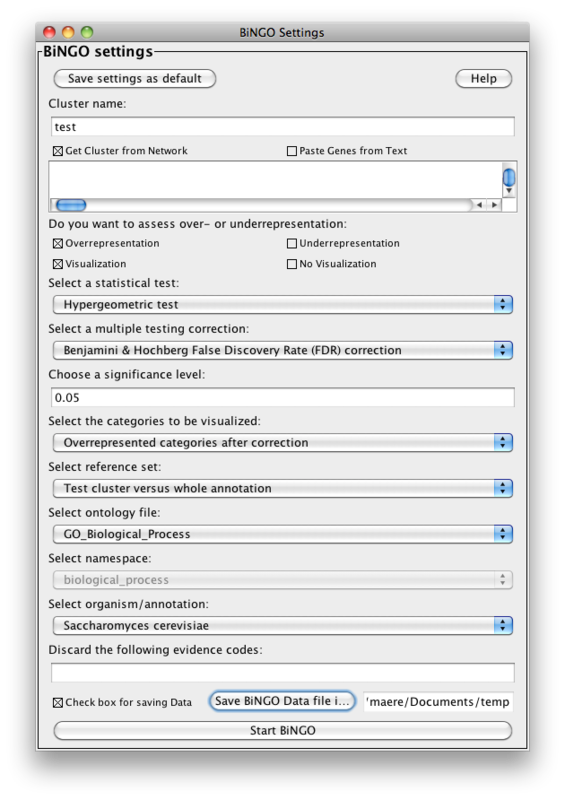 Return to the BiNGO Settings panel and rename the cluster of Arabidopsis genes 'test3'. 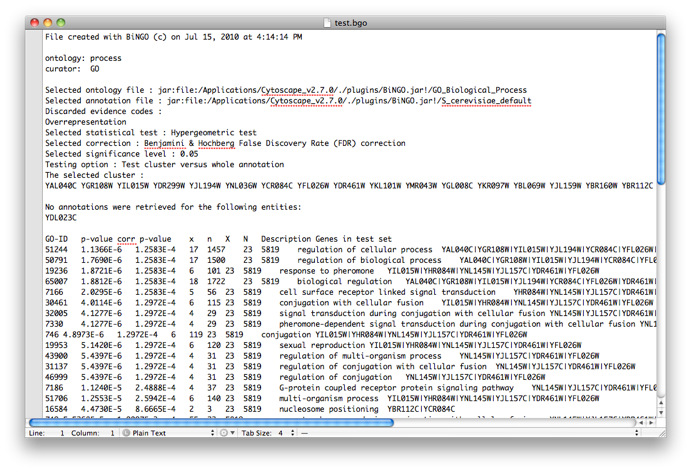 We'll perform exactly the same analysis, except that annotations inferred from electronic annotation (IEA) and sequence similarity (ISS) will be discarded. Fill in 'IEA' and 'ISS' in the evidence code text field and run BiNGO again. The results will be similar, but for instance, 6 out of 12 genes are no longer annotated to the kinase activity category.